Directions: San Mateo SE between Zuni and Central, across the street from Wal-Mart. Highland Pool is one of three public pools operated by the City of Albuquerque used in conjunction with Albuquerque Public School events. 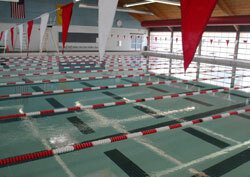 Highland Pool is available to school students and athletes, as well as the public. Highland is also one of Albuquerque's City pools outfitted with solar panels to warm the water and reduce energy costs. Highland pool does not have a summer swim team. Saturday - Sunday Noon - 1 p.m. Diving boards open at 7 p.m. Lap Swim Monday - Friday 6 a.m. - 9 a.m.
Monday - Friday 11 a.m. - 12:30 p.m.
Monday - Friday (limited lanes available) 6 p.m. - 8:30 p.m.
Monday - Friday 12:30 p.m. - 4 p.m.